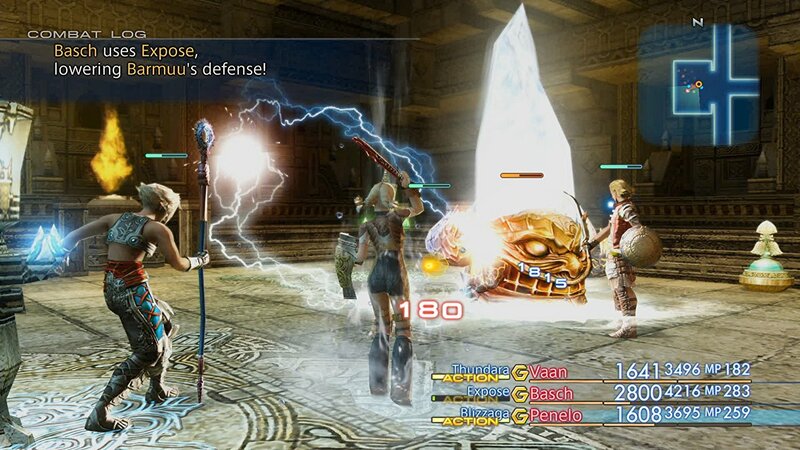 The original PlayStation 2 release of Final Fantasy XII held a lot of firsts for me. It was the first Final Fantasy game I had ever pre-ordered and subsequently purchased on launch day. It was the first collector’s edition I shelled out extra money for. It was also the first time I picked up a strategy guide for a game at launch. 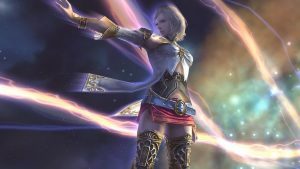 But outside of my own experiences, I know FFXII was also the first to turn the mainline series on its head for the single player entries (FFXI I think shattered most folks’ expectations of what to expect from the main series going forward). While each entry before this had always taken place in a new world with varying mechanics, never before was it this extreme. No, this could barely be considered a turn-based RPG. And yet I loved it. Not at first. So determined I was to make this into a classic turn-based FF game of old, I actually spent the time during battle to micromanage my party members’ actions. Of course, as anyone who has played the game know, this is an exercise in tedium and I eventually began to rely more and more on the Gambit system. It was at that point that I could fully appreciate the game for what it was, rather than what it wasn’t and it quickly became one of my favorites. Fast forward over a decade, and now this late gen PS2 title gets a revival by way of the PlayStation 4, including features that were introduced in the previously unlocalized International Zodiac Job System release. Despite clamoring for such a release myself, I had many doubts over being able to dedicate any length of time to it on account of how long it took me to complete the first time around. Fortunately, Square Enix had such concerns in mind when developing this version and now I can honestly say it’s the definitive release. Even the plot itself is more politically driven than fans may be used to, becoming a tale more akin to Final Fantasy Tactics (which is appropriate considering this game also takes place in Ivalice). 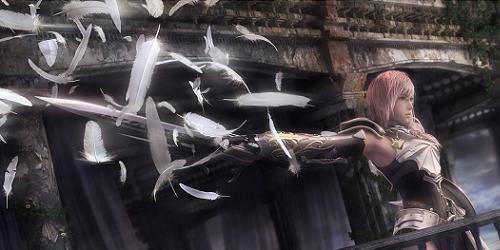 In it, the land of Dalmasca is caught in the midst of a war between the neighboring nations of Archadia and Rozarria. Following the invasion of Dalmasca and the signing of a treaty of surrender, the king is murdered. With the prince having been slain in battle and the princess revealed to have committed suicide as a result, Dalmasca sees little resistance in being occupied by Archadia. However, Princess Ashe is not dead and is building up a resistance of her own in order to take back her country. She is joined by the accused kingslayer Basch as well as sky pirates Balthier and Fran whom she encounters during their escape plundering the castle. Along for the ride is protagonist Vaan and his childhood, Penelo, as they get swept up in this chess game amongst rulers. In short, if you’ve ever wondered how Star Wars would play out if run through a fantasy filter, you’re in the right place. The main plot is a touch predictable, but the localization does an excellent job of selling it as the political war game it wants to be. It doesn’t hurt that the world of Ivalice is a diverse slate of races with their own customs, and features a cast of characters both in the main cast and supporting roles that are extremely interesting and likable. Balthier in particular steals the show with witty dialogue that puts the actual protagonist to shame. He may as well be the leading man as he so often says. His partner in crime, Fran, doesn’t have much to say, but you’ll want to hang on every word regardless just on account of her voice actress. I don’t know what accent that is, but it’s incredibly pleasing to the ear. The rest of the cast is strong as well, save for Vaan and Penelo who the story makes very clear are just along for the ride and don’t have a clear role in the events. The main antagonist is equally as weak, with very little time given to build his character. Also, we’re led to believe that he’s an incredibly despicable man, but as all of the acts of evil he’s said to commit happen offscreen, it’s very difficult to even hate the guy. 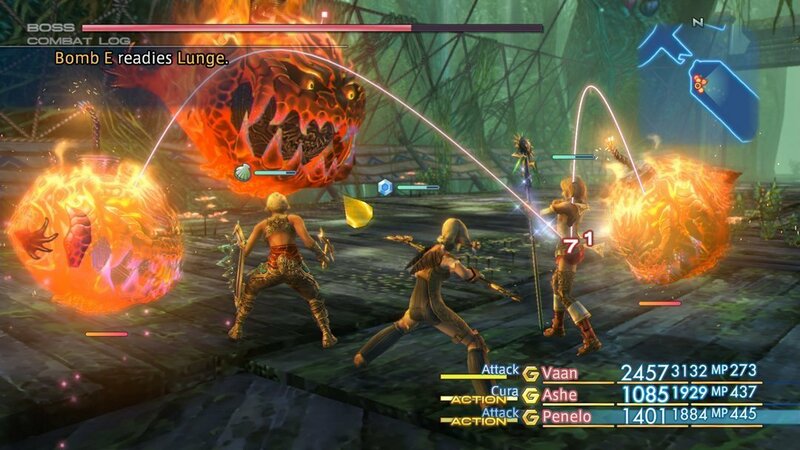 I’ve always felt that the PlayStation 2 held back Final Fantasy XII visually, and it’s nice to see that get rectified this generation. Ivalice is a gorgeous place, and the art style truly sells it as such. And like FFX/X-2 HD before it, the soundtrack is re-orchestrated for the new release, though if you don’t enjoy the changes, there is an option to revert back to the old one. The only place where the presentation falters is the audio quality on the dialogue. The voice acting is excellent, perhaps the best in the series, but the compression they used on the original release is still present. With some characters like Basch or Ashe it isn’t terribly noticeable, but when Vaan talks it sounds like it’s coming from the faraway stall of a public bathroom. It’s an unfortunate blemish in an otherwise stellar audio package. At least it features dual audio, so the purists should be pleased. 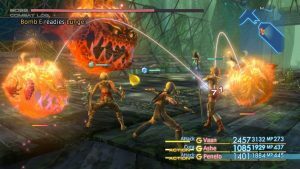 As I alluded to earlier, Final Fantasy XII deviates substantially from its series brethren, operating much closer to the MMO style FFXI than anything that had come before it. Foes are encountered in real time rather than transitioning to a separate screen, and your party of three (sometimes four) trade blows with them before moving onto the next. Each character has the ability to attack, cast spells, or use items as is customary in the franchise, but to manually dictate each action would take an egregious amount of time under normal circumstances. Enter the Gambit System, which has you configure the behavior of your party members prior to your skirmishes in what amounts to a light programming exercise. Specify the target, what action to take, and what the conditions are to trigger it, and your party will take it from there. It’s a great system that places heavy emphasis on pre-planning, while still granting the ability to override actions on the fly. This system does carry the perception that the game “plays itself”, but I promise you that it’s far more intuitive than that. 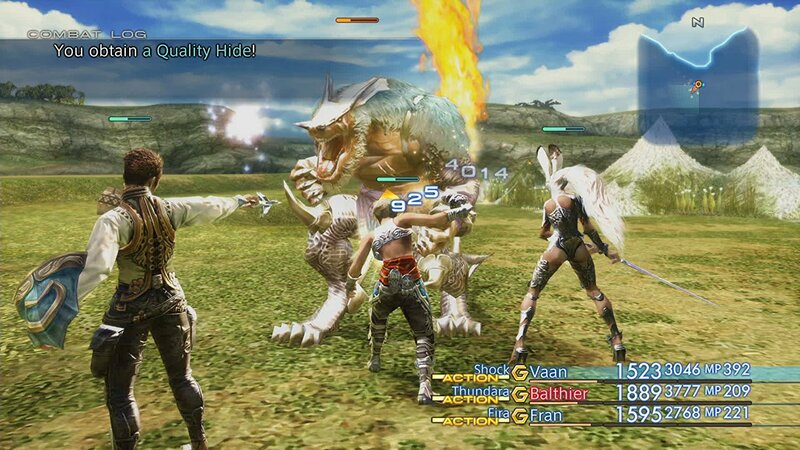 FFXII does have its own form of “Limit Break” as it were, this time going by the Quickening moniker. They’re as visually appealing as you might expect, and can be fired off in succession, which in turn leads to an additional attach animation if you manage to string together enough of them. While the developers did try to make these lengthy sequences interactive (by having you hit buttons in order to potentially unlock and trigger another Quickening to keep the chain going), they do tend to be kind of a drag after awhile. 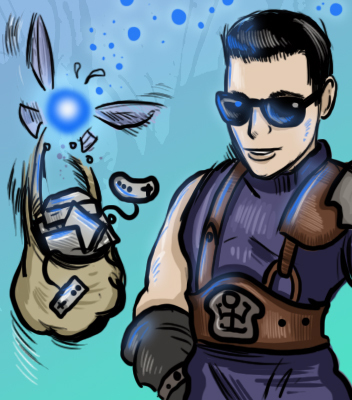 Think of the Knights of the Round summon if you had to hit a button to trigger the next knight to fly by. It’s better than the button mashing of FFVIII, but I still think SE can do better here. One of the biggest changes comes from the way the game handles licenses. In the PS2 version, everything from what armor you could equip to which magic spells you could use were tied to a license. In short, you needed to spend points earned in combat on a license to use pretty much everything. And while that hasn’t changed, characters now must be given specific jobs to determine which licenses they can earn. With twelve total jobs and two that can be assigned per character, no one path is locked out to the player, which is good. It also makes planning much easier than the open-ended original. On the downside though, job assignments are permanent and cannot be changed later, which I feel is a major oversight for a game of this length. Rather than having the opportunity to experiment, you must plan your party’s direction well in advance, which is just poor design. That’s not the only adjustment made for The Zodiac Age. Perhaps the biggest inclusion is a fast forward function that can speed your characters’ actions up by two or even four times, which is a major plus if you don’t have the time to dedicate to massive RPG’s anymore. It took me over a hundred hours to get through the original and that’s without doing everything. I was able to clear the remake in about forty with some minor diversions. A new game plus mode made the cut too, with subsequent playthroughs powering up your party to the 90’s and allowing them to cut down foes with little effort, or locking them in to level 1 and getting slaughtered if that’s more your speed. If you’re looking for more of a challenge post game, there’s also a trial mode that has you doing a hundred rounds of progressively difficult battles. 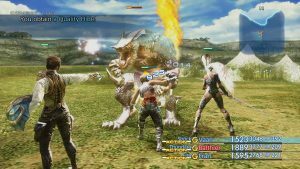 This is all on top of the extra content that was already present, including additional Espers to obtain beyond the ones earned during the story and clan hunts that have you tracking down progressively difficult monsters like a sort of Final Fantasy themed Monster Hunter game, long before Explorers was ever a thing. 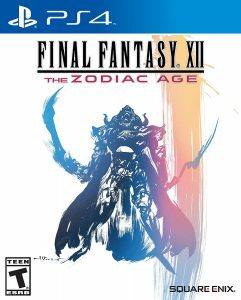 If you enjoyed the initial outing of Final Fantasy XII, then The Zodiac Age improves just about every facet of it. It looks and sounds better (except for the compressed voices), adds conveniences like fast forward and auto saves, plus includes extras like trophies and a trial mode for vets. Not to mentioned the asinine don’t-open-specific-treasure-chests requirement for getting the Zodiac Spear has been stripped out. And if you missed out or were put off by the initial release, the addition of a proper job system and the modern improvements ensure that you’re still in for a treat. Really, the only thing that would make me more pleased is if they also did a Vita (or Switch) version. 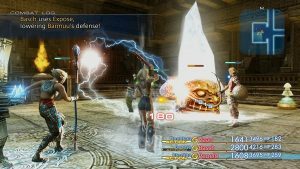 Final Fantasy XII: The Zodiac Age brings the late generation PlayStation 2 release into the modern era by not only touching up the presentation, but also adding on quality of life improvements such as auto-saves and a fast forward feature. In addition, a more newcomer friendly job system has been implemented for those not already well versed with the original, and new game plus and trial modes are tacked on for added measure. The politically driven plot with its exceptional cast hold up quite well over a decade later, and the MMO-style combat, while different from its predecessors is particularly enjoyable. It would’ve been nice if they made job and Esper selections reversible somehow in the late game, but as it stands, Final Fantasy XII: The Zodiac Age is the definitive edition of this often overlooked gem.